Hello everyone! We have another group in Facebook for our favorite virtual game, Ameba Pico. This is actually suggested by Jean Royal Étoile and Chu Étoile and we discussed this in my room last November 30, 2011. As you can see, there are many starter these past few days in Ameba Pico and most of them are not guided and doesn't really have any idea about the game and some of them are old members but non-ag user. Most of them are bullied and treated badly by AG users around and say things to them and look at them down. Please be aware that not all players of this game is in Legal Age. (b) Harass, threaten, abuse, disparage, libel, slander, embarrass, or engage in any other disruptive behavior involving another member or Company or affiliate’s employee or agent. .If you encounter another Member who is violating any of the items described in the Online Conduct list above, please report them to support(at)cyberagentamerica.com." 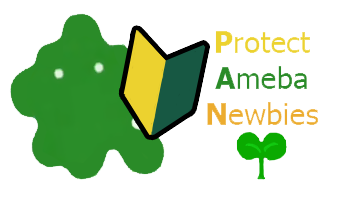 We would like to help the Ameba Pico Starter and non-ag user for their good play of the game. Please help them, guide them when they need something or want to know some thing. Don't snob and treat them well. Please do remember that we all started this game in the same level so don't look at them down! Help us on supporting Ameba Pico Starter through Sharing our page to your blogs, facebook page or Ameba Pico URL! Also, feel free to use these pictures for the support! WE ARE COUNTING FOR EVERYONE'S HELP AND SUPPORT! Newbie's i'll help u at the Pirate Quest don't worry i finish it.